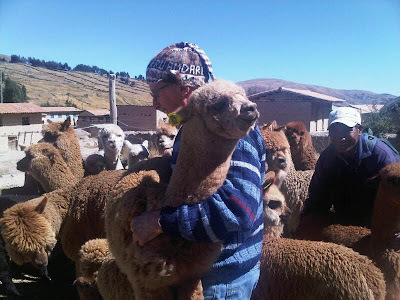 Monique Wherry is part of a contingent visiting Heifer projects in Peru this week. She sends this great photo and the report below from the field where Heifer is working with local partners to improve alpaca farming, market access and food security in vegetables and corn. She says that -- en route to a small village in the mountainous region of Puna-- one of the group's cars broke down. Nonetheless, they eventually made it to a warm welcome in the company of many villagers and llamas. "The villagers greet us with smiles, handshakes and the women are all in beautiful shades clothed in yellow, greens, gold, black and red. We also see lots of beautiful llamas in shades of brown."